Square Root of Minus Garfield is going gangbusters, thanks to readers sending in lots of cool submissions! So much so that we’re increasing the update frequency from 3 to 4 times a week. You’ll now get an extra dose of Garfield wackiness on Thursdays. Enjoy! We also have quite a few Lightning Made of Owls strips buffered at the moment, which is good, but we want to wait just a bit longer before we try increasing its update frequency as well. The buffer of submissions for Lightning Made of Owls has slowly been being whittled away by our relentless five-a-week update schedule. To give the buffer a chance to recover, we’re changing the schedule to three updates a week: Monday, Wednesday, and Friday. Hopefully this will better match the ongoing rate of new submissions. And in case that’s too subtle a hint: We need more submissions! Unleash your comic creative urges and send us your results! 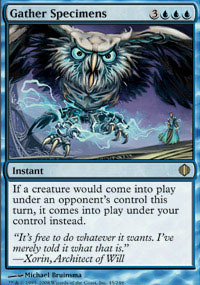 Or, an owl made of lightning. Or something. A few of us were drafting the new Magic: The Gathering set, Shards of Alara – and were astonished to see the motif employed in the artwork of this card: Gather Specimens. One can only assume that it’s Ambrose we see wearing the blue wizard garb in the background. We’ve had so many submissions for Lightning Made of Owls that we’re increasing the update frequency again, from 3 to 5 times a week! The comic will now update every weekday. Yay! Owls cast finalised – start drawing! We’ve finalised the initial cast list for Lightning Made of Owls. You can see the six primary characters here. Now it’s time to get to work and make some comics! Send your comics to us and we’ll queue them up. Hopefully we will start publishing strips next weekend. Meanwhile, we’re still working on the site, tidying up the formatting, coding, and design, so expect some changes over the next week. Do two half-baked ideas make a fully-baked idea? Only time, and you, will tell. You are currently browsing the archives for the Lightning Made of Owls category.